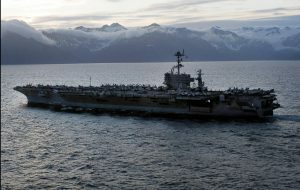 Sen. Lisa Murkowski says the Navy is again snubbing the concerns of Alaskans as it prepares for the next Northern Edge. That’s a military exercise, held every two years, that stretches from the Gulf of Alaska into the Interior. The next Northern Edge is scheduled for May. Murkowski says more than 100 Alaskans sent her letters this summer with concerns about the potential impact of the exercise, particularly on fish and marine mammals. Murkowski sent a sternly worded letter to the secretary of the Navy last week, calling for more transparency. She also chided the Navy for denying Alaska biologist Rick Steiner’s request, under the Freedom of Information Act, for reports on the impact of Northern Edge 2015. Two years ago, military representatives said people were misinformed about the scope of the exercise. They said environmental impact documents described dropping far more ordinance into the Gulf than the Navy actually intended to use. Today, Air Force Capt. Anastasia Wasem, a spokeswoman for Alaskan Command, said the military is finalizing its public outreach plans. Wasem says the exercise was moved from June to May, in part so the military can save money on airfares and lodging, and also so its aircraft won’t complicate air traffic control during high wildfire season.